Tender chicken sautéed with succulent cabbage and cream. 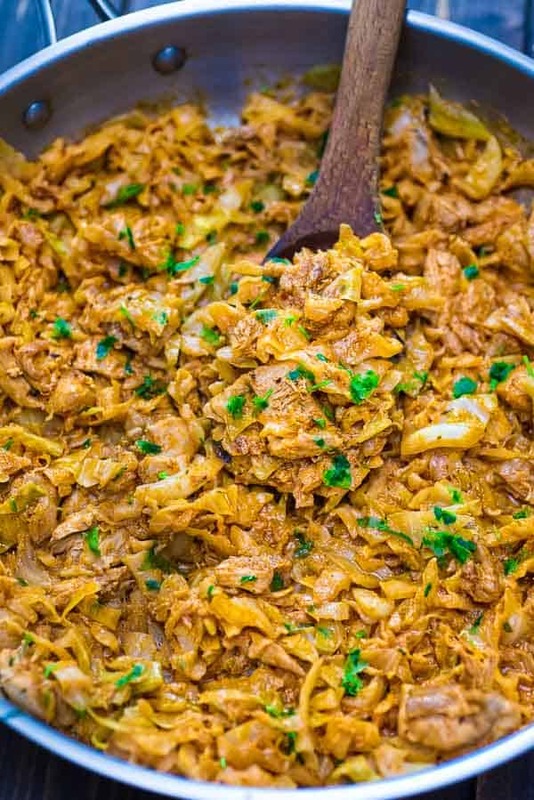 This tasty, one-pot Creamy Cabbage with Chicken will become your family’s favorite in no time! Chicken and Cabbage is truly a winning combo! Flavorful, delicious, and easy to make, this dish is so good, you’ll be making it over and over again. Oh, and did I mention that it is made with just a few simple ingredients and in one skillet? Minimal effort and maximum flavor. Isn’t that what we all want? Let’s talk about the main ingredients first. You’ll want to buy a medium (about 2 1/2 – 3 lbs.) head of cabbage. When shopping for the cabbage, look for ones that are shiny and bright, with a beautiful green color. If you’d like to save time, you can just buy a 2 lb.-package of shredded cabbage. They are sold in most grocery stores, in the produce section. You can purchase the package that includes shredded carrots, too. I almost exclusively use chicken thighs in this recipe. I buy boneless thighs and just cut them into bite-sized pieces. That said, chicken breasts works great, too. 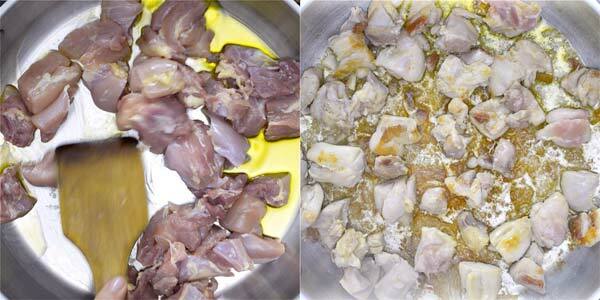 The meat will be a bit drier, but if you prefer chicken breasts, don’t hesitate to use them. 1. Heat the olive oil in a large skillet over high heat. Add the chicken and cook for about 5 minutes. 2. Add the paprika, Italian herbs, salt, and red pepper flakes. Stir and cook for just 1 minute. Deglaze the skillet with about 1/2 cup of water. 3. 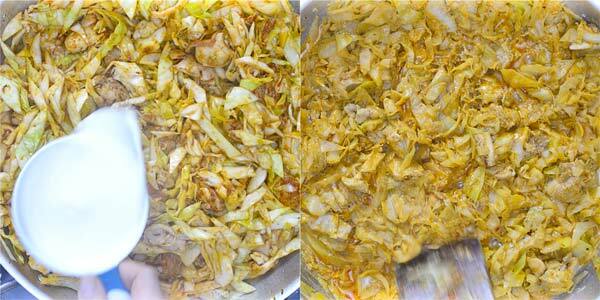 Add the tomato paste, stir, and add the cabbage. Sauté the cabbage for another 5 minutes and reduce the heat to medium-low. 4. Add the Half & Half and cover the pan with a lid, cooking for about 30 minutes. Stir occasionally, until the cabbage cooks through. (Depending on the cabbage variety, it may take a bit longer to cook. 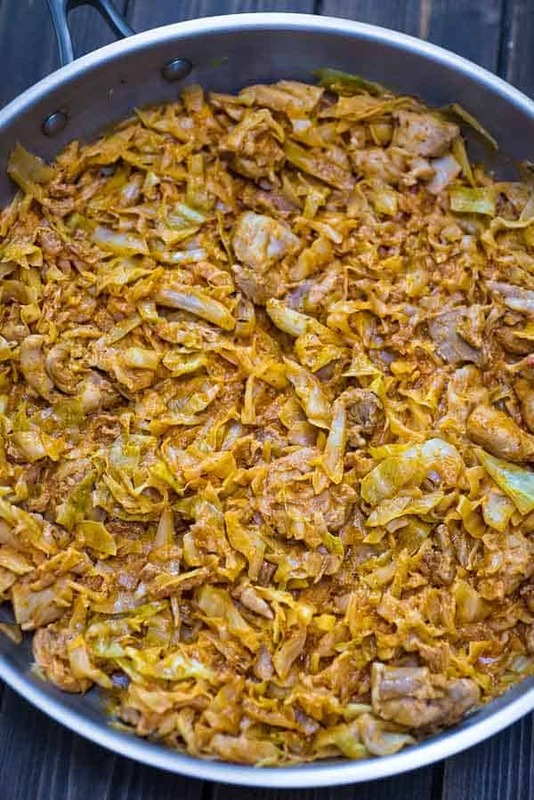 If you don’t have any liquid remaining in the skillet, just add some water and cook until the cabbage is soft). 5. Taste and adjust the salt to your liking. Garnish with fresh, chopped parsley. 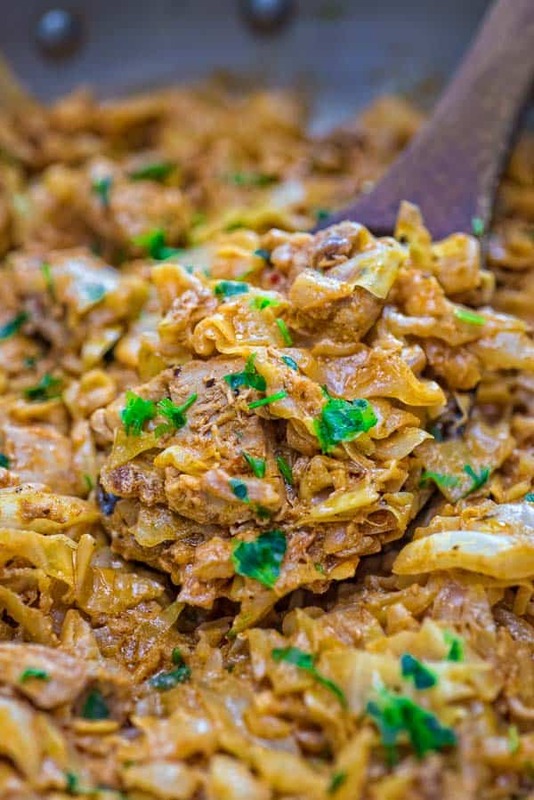 WHAT TO SERVE CREAMY CHICKEN AND CABBAGE WITH? Serve this delicious meal with some rice, mashed potatoes, or fresh salad on the side. You may also serve this meal as is, with a slice of fresh bread. Heat the olive oil in a large skillet over high heat. Add the chicken and cook for about 5 minutes. Add the paprika, Italian herbs, salt, and red pepper flakes. Stir and cook for just 1 minute. Deglaze the skillet with about 1/2 cup of water. 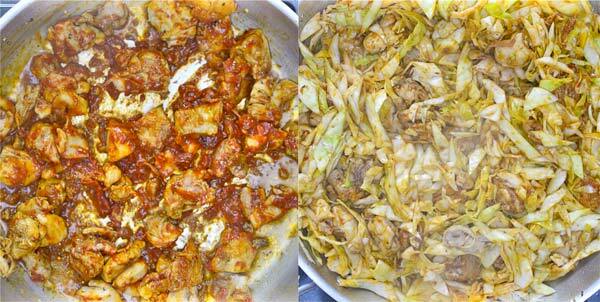 Add the tomato paste, stir, and add the cabbage. Sauté the cabbage for another 5 minutes and reduce the heat to medium-low. 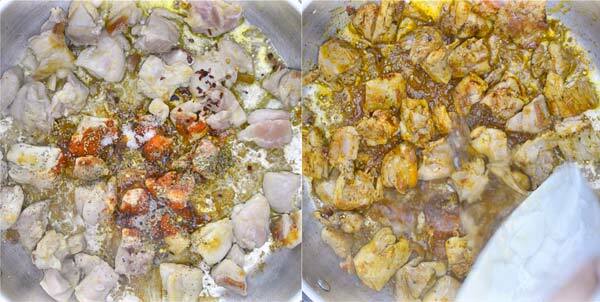 Add the Half & Half and cover the pan with a lid, cooking for about 30 minutes. Stir occasionally, until the cabbage cooks through. (Depending on the cabbage variety, it may take a bit longer to cook. If you don’t have any liquid remaining in the skillet, just add some water and cook until the cabbage is soft). Taste and adjust the salt to your liking. Garnish with fresh, chopped parsley. I had thin sliced chicken, I added parmesan cheese and totally changed taste. Loved it. 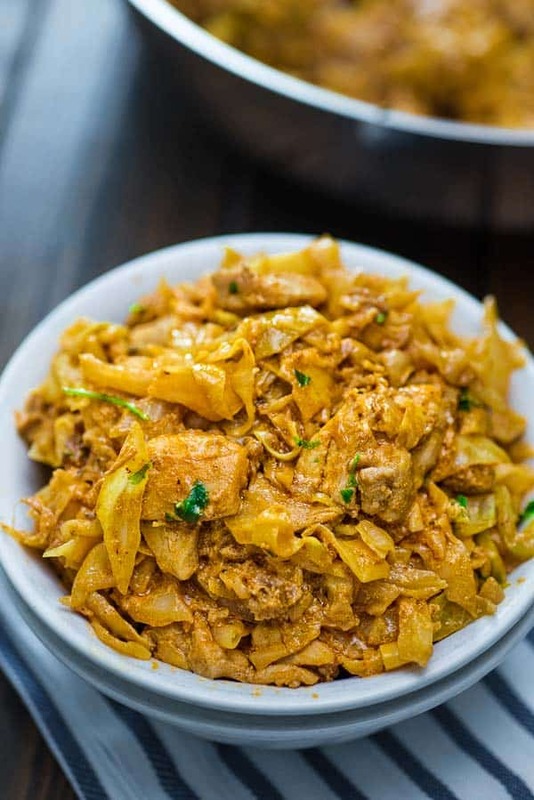 Very creamy, cabbage was tender and sliced like an egg noodle, Thank you for recipe, felt like I was eating a pasta dish (trying to be low carb). Hi Jan! I am glad you enjoyed the recipe! Thank you for the feedback! I just made that creamy cabbage with chicken, so good! And totally fits into my Ketogenic diet. Way to go Tania! Thank you so much, Annie! I am glad you loved the recipe! Instead of heavy cream, do you think I can use one part greek yogurt and one part almond milk? Hi Lisa! I am not sure how it’ll turn out. Let me know if you do try it this way. Thanks! Hi Tania ,I have just joined your site because last week I made for my family Chicken with your special mushroom sauce .It was fantastic <( I am making it again tonight as a request from my wife,but I have seen your recipe for creamy chicken and cabbage and want to make that too. I live in Spain although I'm English and I haven't heard of Half and half ,is it sour cream and whole cream? keep up the good work Bob. Hi Bob! Sorry for the late reply, I have very limited internet access while on vacation. I am so happy your family enjoyed the Mushroom Sauce. I absolutely love to pair it with my Classic Potato Cakes. Half and Half is a mixture of milk and cream. I would suggest using whole cream instead. Happy cooking! Hi Tania – I made this last night and it came out great. I only used 1/3 cup of cream and I used some unsweetened almond milk for the remaining 2/3 cup (that really reduces the calories and fat). Still came out great and the sauce was still what I would call “luxurious”! This came together very easy. I dashed some Sriracha on top to add a little heat – it was great! Hi Dave! Thank you so much for the feedback! I love the idea of almond milk. I will try it in the future. Have a super day, my friend! While I love cabbage I’ve never had a dish like this! This looks a great way to enjoy it and this dish looks so creamy and delicious! Thank you, Marcie! My family loves this dish! Oh dear, it’s early morning here, you know, and this really makes me hungry! Thank you! Pinning for future!